At the dawn of the 1970s, film audiences in the West began to discover martial arts films from East Asia. And one of the results of that cross-cultural exchange is this odd yet remarkable document from 1973, La dialectique peut-elle casser des briques? (Can Dialectics Break Bricks?). It consists of a Hong Kong kung fu film, The Crush (1972), dubbed into French (additionally subtitled into English for the US release), turning the story of martial arts conflict into a fable of an oppressed proletariat struggling against Soviet-style state capitalist bureaucracy. For the generation of French student activists who felt betrayed by France’s Soviet-aligned Communist Party in the student-initiated revolt of May 1968, Can Dialectics Break Bricks? was more than a playful example of the culture-jamming method known as détournement, practiced by the Situationist International. It was a eulogy for the promise and potential of a decentralized, left-anarchist revolution against the Gaullist Fifth Republic, the French Communist Party, and the trade union officials who diverted the May ’68 movement from its true revolutionary potential. Prior to the student movement, the postwar avant-garde in France had looked back to interwar groups such as the Dadaists and Surrealists for inspiration. Lettrism, a movement founded by Isidore Isou, sought to break down or “chisel” French art and society just as its Surrealist forebears had in the 1920s. 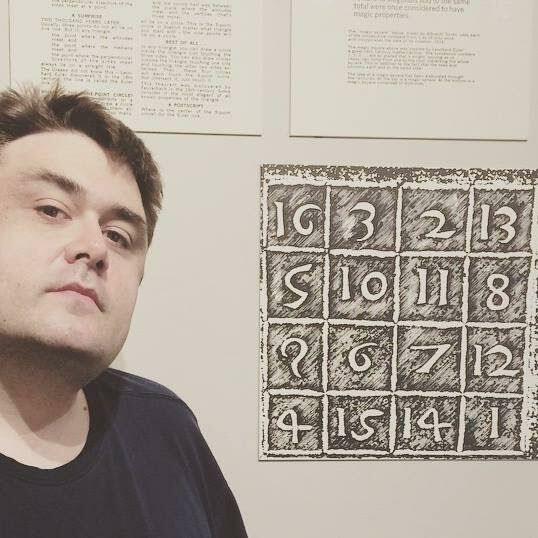 This involved breaking down the semantic messages of all kinds of art—poetry, prose, typography, photography, and film—to their most basic components. A young Lettrist adherent named Guy Debord took this mission of disruption further and along a more explicitly political dimension in the 1950s, breaking from Lettrism (over Isou’s admiration of Charlie Chaplin) and forming an organization called the Letterist International, its name explicitly reminiscent of the various Communist Internationals. Debord’s faction took its mission to even more aesthetic venues than Isou’s, seeking even to disrupt Western capitalist architecture and urban planning through its aimless “dérives,” or “drifts,” through the urban landscape. Debord’s Letterist International eventually found common cause with other avant-garde leftist movements throughout Europe and, in 1957, Debord synthesized his beliefs in a new organization, the Situationist International. The SI centered its political approach around defeating the alienation inherent in postwar capitalism through “Situations,” a disrupting and diverting of the new mass media Spectacle that had grown up around capitalism to control the masses, and thus liberate the masses from their lives of toil in yoke to both the state and the bourgeoisie. As French society entered the 1960s, more and more young people saw in Debord’s writings and aphorisms a key to understanding their own increasing alienation. Thus, Situationism provided much of the theoretical punch behind the increasing student unrest in the late ’60s in France, first in 1966 in Strasbourg, where explicitly Situationist statements such as The Poverty of Student Life provided the intellectual backing for student revolt, a dress rehearsal for the nationwide uprising that almost led to revolution in May 1968. In many ways, Situationism’s street-graffiti ideology, incorporating punchy, advertising slogan-style aphorisms (“Never work,” “Under the paving-stones, the beach!“), was the bridge between the student population and the broader worker movement. The disappointments over the failure of May 1968 to radically change society meant that Situationism largely retreated back into the artistic and academic world. From this milieu came Can Dialectics Break Bricks?. As mentioned, the Situationist practice of détournement sought to take media commodities that reinforce the societal status quo and use them to convey subversive ideas. Situationists had been doing this since the first days of the movement, with one of the most famous examples being the 1966 détourned comic, The Return of the Durutti Column, released during the student unrest at Strasbourg, which explained Situationist ideas in the form of a re-captioned series of comic images and photos. The mind behind Can Dialectics Break Bricks? was an academic named René Viénet, a scholar of China who’d been kicked out of that country as a student in the mid-’60s for fulminating against Maoism. Aligned with the anti-authoritarian tendency of the student revolt and Situationists in the late ’60s, he became an active adherent of détournement. The original text in this case, the 1972 Hong Kong kung fu film The Crush, tells the tale of Korean-Chinese martial artists resisting an invasion by the Japanese. Obviously, on the level of the original film, this is a historical tale of resisting colonialism (with the added echoes of the Japanese atrocities on mainland Asia during World War II). But in Viénet’s version, the real ideological sparring happens through the mischievous dubbing. Dialogue, usually the least interesting part of a martial arts film, now becomes a bawdy, irreverent philosophical debate, with the French dub putting words in the mouths of the Hong Kong actors. The Japanese colonists assume the role of all oppressive statists, most notably recalling the role that the Soviet-aligned French Communist Party played in stopping the 1968 revolution. The extraordinarily apt double entendre of “bureaucrat” works well here; in kung fu films, the “bureaucrat” often represents imperial overreach and is resisted by the poor oppressed heroes (Chinese martial arts are a profoundly proletarian art form, used to resist oppression throughout Chinese history). The Korean-Chinese resistance are dubbed to sound like proletarians, student radicals, and Situationists, valiantly resisting co-optation by the state capitalist bureaucrats. Much of the conflict comes from the bureaucrats’ desire to force the proletarians to work for them, offering tired Communist phrases (“Work is freedom”) to motivate them. In Marxist terms, the bureaucrats in Can Dialectics Break Bricks? not only possess the base (the unions, the means of production) but also the superstructure (the leader of the bureaucrats says that it’s fine for the proletarians to exercise their dialectic for “work, family, and fatherland,” a fairly clear piece of culturally nationalist and conservative sloganeering). But the moment that the dubbed proletarians begin to say they’ll resist through wildcat strikes, arson, looting, or otherwise disturbing the smooth functioning of the state, the leader of the bureaucrats will escalate, sending in his “sociologists, psychiatrists, urban planners, architects… my Foucaults, my Lacans.” Here Viénet expressly connects the ostensibly left-wing academic practitioners of structuralism, post-structuralism and deconstructionism with the oppressive forces of the state. Viénet’s dubbed lines here also echo the long-held Situationist belief that postwar architecture and urban planning are profoundly hostile to the people forced to live among them. The figures admired and name-dropped by the film’s rebel heroes are of a decidedly anarchistic mien, including Bakunin, Bonnot, Makhno and the broad coalition of anarchists and left-libertarians in the Spanish Civil War, the Spartacists. Those fighting colonialist oppression—Lumumba and the protestors in Watts—are also given brief shout-outs as favored by the proletarian fighters. Can Dialectics Break Bricks? thus ends up being the inverse of the typical kung fu movie: the viewer ultimately ends up paying more attention to the dialogue than the fight scenes. However, the dubbed lines occasionally take notice of how the Japanese invaders and bureaucrats are the only ones to regularly wield weapons, saying that they have “the army” on their side. Whether this means the French army in ’68 or the Red Army that had brutally repressed anti-Soviet uprisings in Hungary (1956) and Czechoslovakia (1968) is left somewhat ambiguous. At the end of the final, grand fight scene, only a few of the proletarians are left standing; it is intimated that these few survivors will be left to tell the story of revolution against the oppressive state for future generations. While it’s a clear metaphor for the ’68 generation, it’s also a somewhat pacifistic statement. 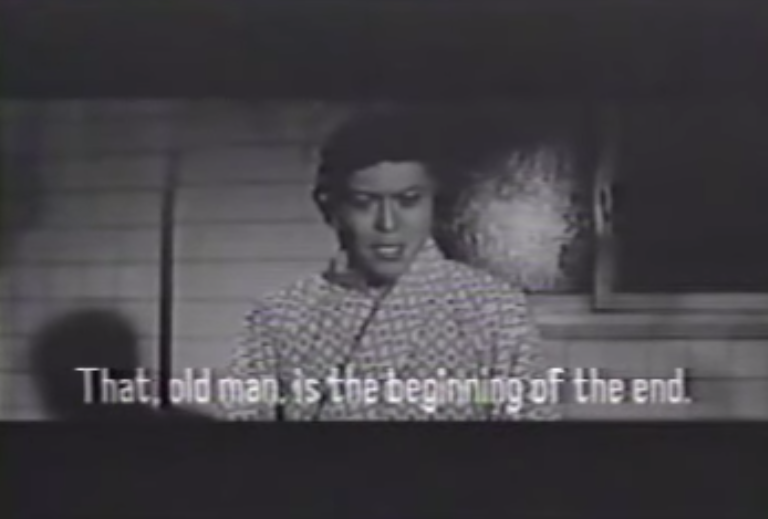 Throughout the film, the proletarians themselves cite the importance of ending alienation through détournement (one of many fourth-wall breaking, metafictional moments in the script). The proletarians and kung fu Situationists are ultimately not afraid to fight with chops, kicks, and swords, but it’s clear that their primary battlefield is the cultural and psychological one. In fact, the main “plot” point of the film involves what it’s like for a young revolutionary to be offered a place within the state bureaucracy, which expresses clearly how revolutionary ideas are co-opted and recuperated into the system, another crucial Situationist idea. Part of the value of détournement is its juxtaposing of elements of the Spectacle with radical political beliefs to shock and awaken the proletariat out of their alienation. Certainly the casual cursing, radical politics, and the humor in Can Dialectics Break Bricks? all produce this shock. Putting sexually transgressive Reichian and even Sadeian ideas in the mouth of a young child kung fu student (seemingly dubbed by an adult woman) seems, at least to modern eyes, to be a disturbing misfire, but it’s honestly no different than American farces like Airplane! (1980) from the same time period playing with similar motifs to shock their audiences. Since some of the humor comes from seeing these martial arts actors parroting beliefs that would have been an enormous in-joke, only completely understandable to an educated left-wing Parisian audience of 1973, the entire film could be seen ultimately as an indulgent exercise. A further critique could be found in taking a piece of entertainment from China and essentially colonizing it with French dubbing. Viénet obviously did not invent this idea; Woody Allen’s early cult hit, What’s Up Tiger Lily?, did the same with a Japanese spy flick nearly a decade before. In both cases, the dub generates its humor from the inherent conflict between source material and the détourned text. But the act of dubbing a film, even a faithful dubbing that is not a détournement, is itself a political act; the poor dubbing and subtitling of kung fu movies for the West, especially in their heyday in the 1970s, were at their root yet another labor issue. Ultimately, the power of Can Dialectics Break Bricks? comes not in its moments of deliberate shock but instead in the moments of correspondence and similarity with the real world outside the cinema. Being the underdog, harassed by callous invading bureaucrats, is the same whether you’re a Korean peasant in a kung fu film or a student radical trying to overthrow an oppressive technocratic system seeking to making lackeys of us all. This appeal to the oppressed was one of the main reasons martial arts films achieved widespread popularity in Black communities in America well before they had mainstream success with white American audiences. 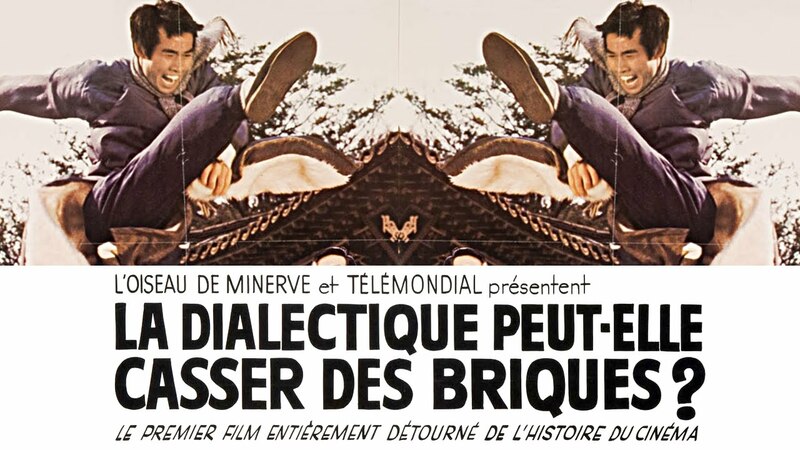 The heroes of Dialectics spend their entire film sticking it to the Man, like so many other film comedies of this era, and that message endures far beyond the film’s extremely specific references to early ’70s French politics and culture. 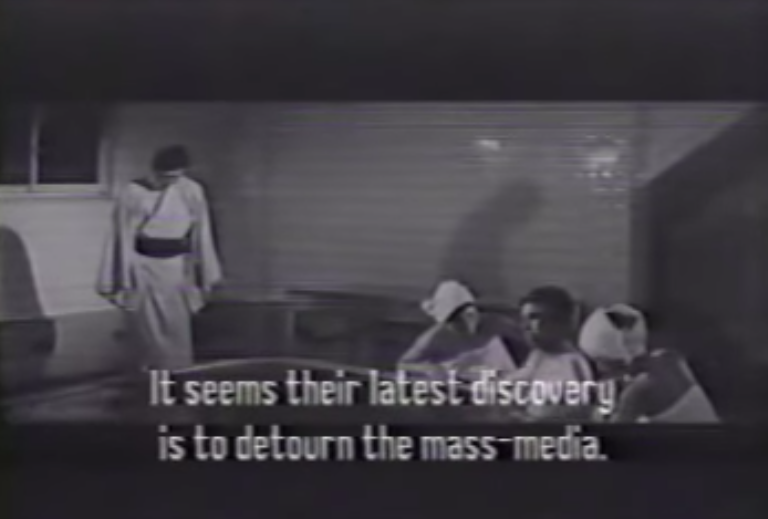 In the introduction, one of the narrators states that “All films can be détourned: potboilers, Vardas, Pasolinis, Caillacs, Godards, Bergmans, as well as good spaghetti westerns and all commercials.” Both the leftist art film and the TV commercial are equal in the eyes of Situationist pranksters; all can be leveraged to critique the Spectacle and jolt the proletariat into action—perhaps producing a laugh and some joy along the way.